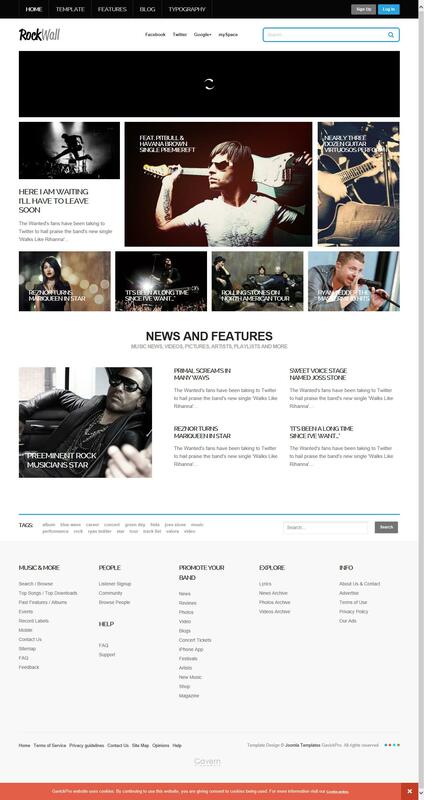 GK Rockwall - amazing template music theme is the development of design studio GavickPro, perfect for Joomla ver. 2.5x. Has a lightweight design in bright colors. By passing this template, there are four color schemes to choose from. As always GavickPro used all the best to create a template, that's why it was developed on the newest version of one of the proprietary frameworks, namely Gavern. In the assembly GK RockWall club included the following extensions: Image Show (to rotate the image), News Show Pro GK5 (to display news) and Tabs GK5 (for the implementation of the tabs). Also, the developers have made ​​sure that you can easily manage all the materials your site is used for this component K2, which is responsible for the content. GK RockWall - perfect choice for creating both music and news portals.